We are happy to announce that the charter yacht ANDROMEDA LA DEA won Best In Class and the Perini Award at the 2010 St Barth's Bucket. 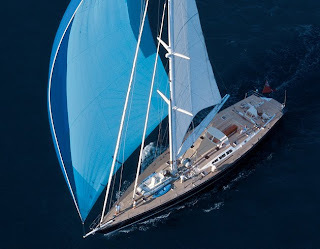 Andromeda La Dea is a beautiful 144-foot sailing yacht which accommodates up to 8 guests in 4 staterooms. Professional international crew of 9 including: licensed masseuse, beautician and prize winning chef. 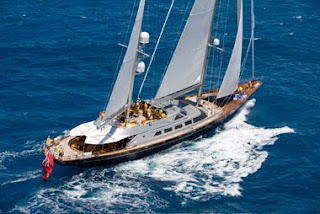 We don't post megayachts very often but this one just came into our inbox and we HAVE to share. It is the m/y H20ME. 144 feet (44m) with a crew of 5. Accommodates up to 10 guests in 5 staterooms. This yacht is available for charter this summer in the Western Mediterranean. Currently available for the Cannes Film Festival with a CONFIRMED berth in Port Canto. "The concept design and the external lines, which concern bottom, hull and engineering, let H2ome be considered a 'race' yacht. Thanks to the narrow and long bottom, the 'double speed' hull at 20 knots, allows a nagivation in displacement speed, that is, an economical (700 litres/hr) and comfortable navigation, whereas the planing hull allows a navigation in surfing speed reaching a maximum speed up to 36 knots (1800 litres/hr)." Bentley Continental GT - The H20 Car Tender is available for chartering, both for your pleasure and for businesstrips. The staff will organize and supervise your land transfers carefully and discreetly and, on your request, hostesses, interpreters, tour guides, and other personnel can accompany you for your safety. Both H20 Tenders can remain available for any change introduced to the cruise, such as a flying visit to a Montecarlo casino or a romantic dinner in Paris. Of course, you have the toys of jet skis, nice dinghy, waterskis, pull/towing toys, etc. 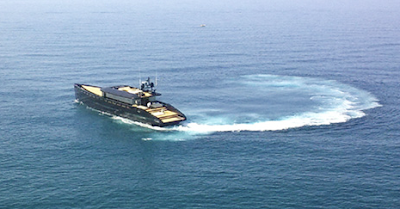 that you would expect on a charter yacht, too. 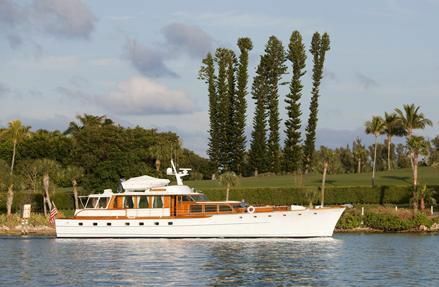 The charter yacht WISHING STAR is an immaculate 84-foot Classic Trumpy motoryacht. A true classic gentleman’s motor yacht, Wishing Star is exquisitely maintained with a handsome and impeccable interior. She is the ideal choice for those who appreciate traditional elegance afloat. Wishing Star is currently available in S. Florida and will be chartering in New England this summer. Wishing Star is fully air conditioned and accommodates up to 6 guests in 3 staterooms (one queen and two twins). Capt. 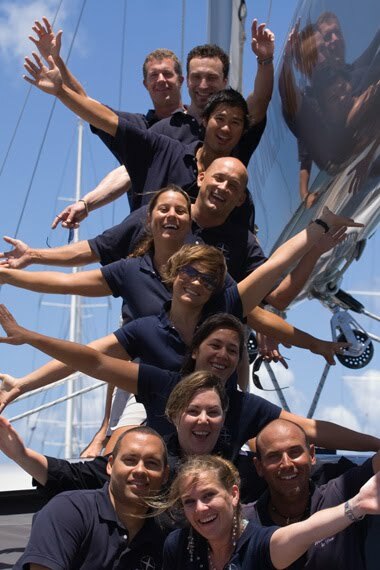 Fred Dillon and his crew look forward to having you aboard! 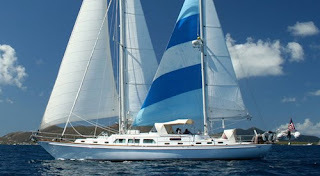 Charter yacht VERNA BREEZE is a 54-foot Gulfstar, owned and operated by Chris and Kelly Allison. We were anchored nearby in Simpson Bay Lagoon, St Martin last summer and ran into them on an almost daily basis at the marine stores, shopping, and at our favorite Chinese restaurant. 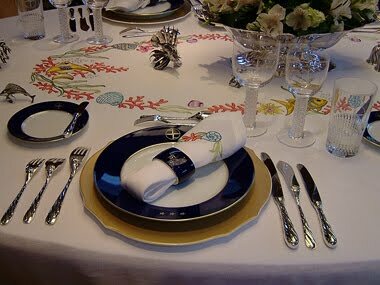 Chris and Kelly are super people and we can tell that they will excel in the hospitality aspect of chartering. As this is their first year of chartering (they have been cruising for several years and are definitely not newbies to sailing), Verna Breeze is offering an introductory "get to know us" discount through December 15, 2010. Verna Breeze is basically a 2-guest boat, but they do have an additional guest cabin with two single bunk beds. Children are welcome. We love their huge awning that they can quickly assemble on the foredeck. Kelly is a PADI Dive Instructor and Verna Breeze offers "casual" diving to certified divers. Casual means a few dives during the week, leaving plenty of time to experience other activities and relaxation. Verna Breeze is not a dive-intensive charter yacht for divers who are looking for a hard-core dive boat to do 3 or more dives per day. The charter yacht GADGET, a classic Hinckley 64, has reduced their charter rate for the remainder of the winter 2009/10 season. 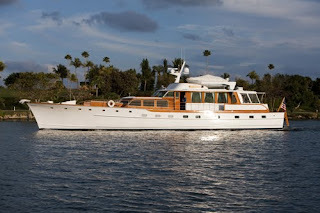 The beautiful, classic Hinckley 64 GADGET is currently on a charter in the British Virgin Islands. Captain Ken Lannamann enjoys identifying the constellations & planets for guests, and reports that their guests were thrilled to see the Southern Cross for the first time! Their charter guests have also been amazed and delighted with the delicious & artfully presented cuisine of GADGET's superb chef Giesle. Ken and Giesle also arranged for their guests to enjoy a grilled lobster dinner ashore on Anegada (a remote reef strewn island with some of the most beautiful beaches in the Caribbean), under the stars at the water's edge. Humpback whales frequent the waters near Anegada this time of year, and the Lannamann's and their guests are on "whale watch" for the next few days hoping to create even more memories of a lifetime! 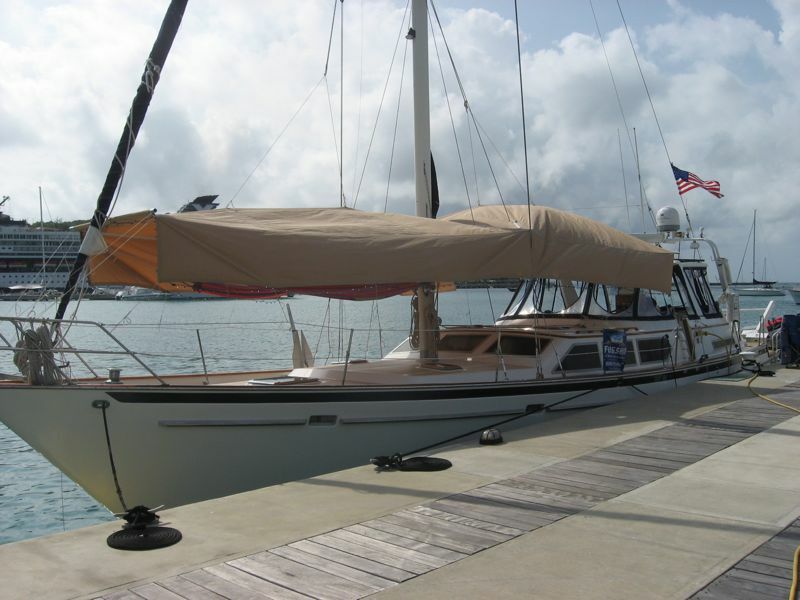 This pristine yacht is available for summer 2010 charters in New England at the weekly charter price of $15,500 plus all expenses. 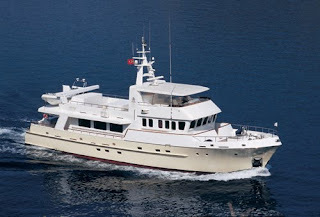 The charter motor yacht TIVOLI, is joining in on "March Madness" with their all-inclusive special offer for May and June 2010 charters in Antigua. TIVOLI is a 90-foot motoryacht with a crew of 4, and accommodates up to 6 guests in 3 staterooms. $29,500/week for up to 6 guests – fully inclusive of food, standard bar, 2 nights' dockage (boarding and disembarking), local taxes and fuel included for Antigua-Antigua itinerary. TIVOLI is based in Antigua. Delivery and redelivery for other locations is additional, however up to 4 hours per day of fuel will be included in this special price. Book before June 30, 2010 and receive the special price of $30,000/week for up to 6 guests, plus all expenses or $42,850 for a 10-day charter, plus all expenses. 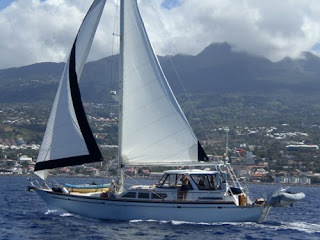 ALIDADE is offering a 15% discount for charters taking place during the month of April 2010. ALIDADE is a 58-foot Catana catamaran with a crew of two. 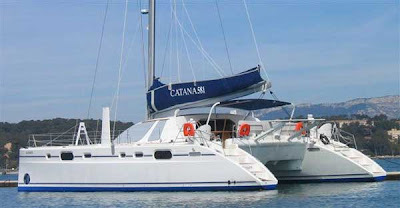 This catamaran is fully air conditioned and accommodates up to 8 guests in 4 cabins, each with ensuite head/shower. One of the aft King cabins can be converted into 2 twin berths if desired... a very nice feature. 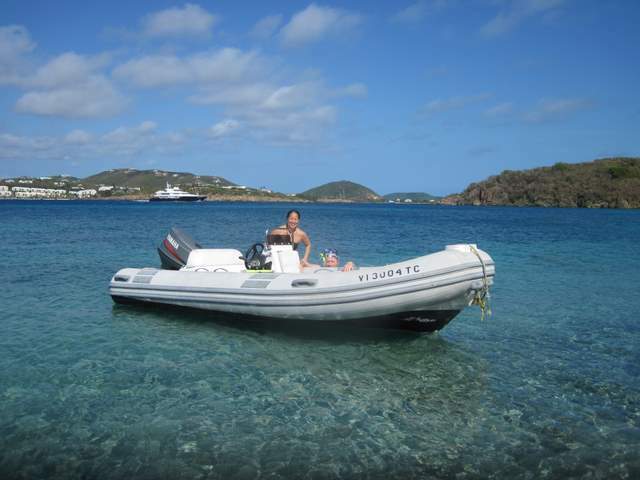 ALIDADE is currently available from April 4 - May 1, 2010 in the British Virgin Islands. We received a recipe this morning from Shelly, chef & co-owner of the 72-foot charter yacht, Three Moons. 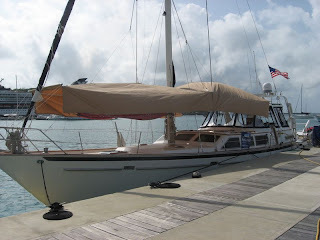 Three Moons is a 72-foot Irwin ketch with a crew of three, owner-operated by Shelly & Randy Tucker. Three Moons is fully air conditioned and accommodates up to 8 guests in 4 double cabins with ensuite heads. Carefully guarded like a leprechaun's pot of gold, our recipe has never been shared, until today! Enjoy! There's nothing like the tropical taste of key lime juice mixed with chocolate and coconut that will have you dreaming of the islands! 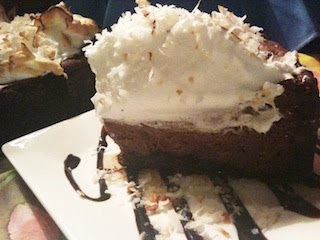 Competing against nearly thirty chefs, Three Moons won third place in the November 2009 Virgin Islands Charteryacht League Culinary Competition with Kiss-Me Key Lime 'n the Coconut Chocolate Cheesecake. Join us in celebrating our eleventh culinary competition award in the past twelve years! That's no blarney! Place a rack in the center of the oven and preheat the oven to 325 degrees. Set aside a 10-inch springform pan. Place the cake mix, melted butter and 1 egg in a large mixing bowl. Blend with an electric mixer on low speed for 2 minutes. Stop the machine and scrape down the sides of the bowl with a rubber spatula. The batter should come together into a ball. With your fingertips, pat the batter evenly over the bottom and up the sides of the springform pan, spreading it out with your fingers until smooth. Set the pan aside. Place the chocolate chips in a medium-size glass bowl and heat in the microwave on high for approx. 2 minutes. Remove the bowl from the oven and stir with a small rubber spatula until they are melted. let the chocolate cool slightly. Place the melted chocolate, cream cheese and sweetened condensed milk in a bowl and blend with a mixer on low speed until just combined, 30 seconds. Increase the mixer speed to medium and beat 1 minute more to thoroughly cream the mixture. Add the 3 eggs and the lime juice to the batter. Beat on medium speed for 1 minute scraping down the sides of the bowl periodically. Pour the filling into the crust and place into the oven. Bake the cheesecake until it looks shiny and the center barely jiggles when you shake the pan, 55-65 minutes. Remove the pan from the oven and place it on a wire rack to cool for 30 minutes. Preheat broiler. Beat egg whites, sugar, cream of tartar and coconut flavoring until stiff peaks form. Spread on top of baked cheesecake. Place under the broiler and watch carefully as the meringue browns. Remove when when lightly browned and cool. 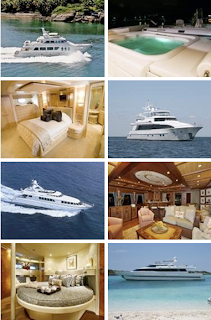 Looking for a classy motor yacht to charter in the Caribbean for Easter or Spring Break 2010? Charter rate: $45,000/week, plus all expenses. Plus, we would like to mention another excellent motor yacht in a different size and price range, FLAME. FLAME is a 65-foot Feadship with three equivalent Queen cabins, each with ensuite head/shower. Flame has an excellent reputation and is owner-operated (a very important quality) by Wayne & Barb Elsworth, and don't forget Jacob, the ship's cat. Based in the Virgin Islands. 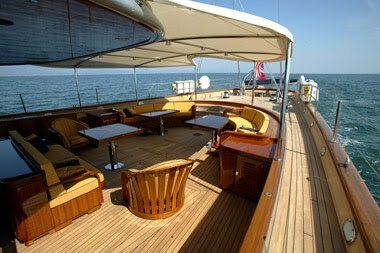 During January & February 2010 KALIKOBASS II underwent a general refurbishment, including upgrades to mechanical and electrical equipment. 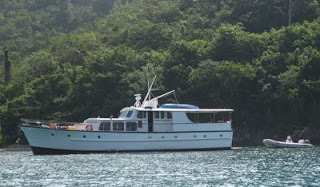 Her topsides and transom were repainted; the shower units in guest baths were repainted; the companionway steps, floorboards, trim, handrail, salon table and flagpole were re-varnished; and all heads were refreshed as needed. The mechanical equipment, including engine, generator, and engine room fans were repainted. The salon fridge was rebuilt, and a new fridge/freezer compressor and thermostat were installed. The engine underwent its general 2000 hour service, as did the generators. Electronics were upgraded with new VHF plus antennae and B&H upgrades to the navigation software. The rigging was updated with new reef lines. The interior has new pillows in the guest accommodations, new director chair covers, new accent cushion covers and all cockpit cushions were cleaned. You may be confident that KALIKOBASS II's continuous ridged maintenance schedule assures excellent condition and guest comfort. 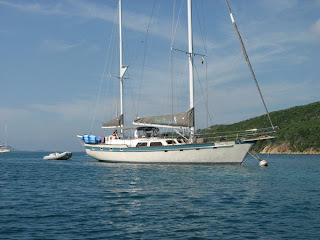 Kalikobass II is a 105-foot sloop with a crew of four. 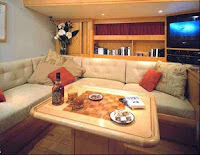 Kalikobass is fully air conditioned and accommodates up to 8 guests in 4 cabins. The master cabin has a king size bed, bath/tub, shower and head. The other 3 cabins each have a king size bed, bath/tub, shower and head.